Born 1928 in Moultrie, Ga. A regular on the Dixie Barn Dance (WKAB, Mobile, Ala.) in 1953. Stationed at Fort McPherson, Ga., in 1956. Died in 2004. Fan magazine article: "Mr. 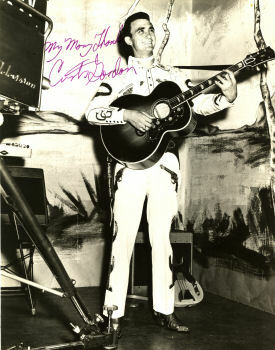 Personality: Curtis Gordon", Country Song Roundup, 1957/Apr. Fan magazine article: "Stars On The Horizon", Cowboy Songs, 1953/May. Fan magazine article: "Stars On The Horizon", Cowboy Songs, 1954/Aug. Feature article and discography in issue 6 (1983) of Roll Street Journal. Article in issue 146 (1995) of Now Dig This.